$14.99 Free with qualifying purchases at shop.LEGO.com, July 2017. 40251 Mini Piggy Bank is a Creator set released in July 2017. 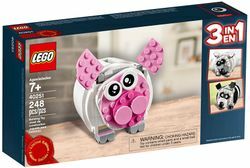 Facts about "40251 Mini Piggy Bank"
This page was last edited on 11 September 2017, at 12:54.